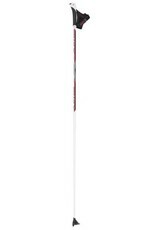 New economy pole in the Swix composite program. Performance close to Comp and all components of well proven Swix quality. Comes with PC handle and Just click system and large 97 racing basket. Stiffness: 43 mm Weight: 99 gr/m Strength: 70 kp Diameters & lengths: Handle 16 mm, basket 10 mm. 135 cm - 175 cm. 5 cm interval. Recommended use: Groomed trails, classic skiing, skating and cruising.